Pay like a local overseas with the DBS Multi-Currency Account and DBS Visa Debit Card with no foreign exchange fees – More $$ for Shopping! 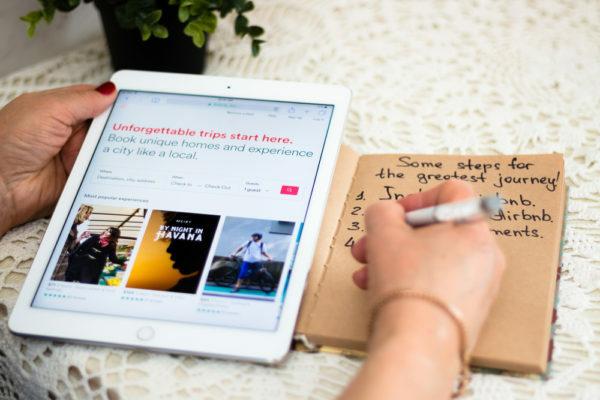 To me, travelling is not about just the actual trip itself but also the pre-trip planning experience – the research for the best places to see and eat and trying to suss out a good bargain with promo codes. (1) Get the list of long weekends to get the most of your limited vacation leave. (2) Stalk flight comparison websites and budget airlines obsessively to get the best deal for your trip. There will be day trips or journeys across the country so intercity travel bookings either on the express train or intercity flights have to be secured. (3) Apartment ogling on booking.com, hotel.com or Airbnb is next. (4) Booking of attractions online also allows you to skip the queues and save significant time compared to getting it at the door. (5) Settling the logistics such as booking of airport transfer, reserving of portable Wi-Fi devices etc. to ensure a smooth trip and most importantly that you remain connected to your social networks. (6) Lastly, travel shopping e.g. for winter wear for the kids or for travel essentials e.g. money belt, travel locks etc., may also be cheaper if bought online. For winter wear, I get mine during Thanksgiving, Boxing Day sales online from US websites (e.g. carters.com for the kids) plus shipping is usually discounted. As you can see, that is a lot of pre-trip transactions to be made online, in another currency and sometimes multiple currencies (depending on where you go). While buying tickets online offers a lot of convenience and time savings, the foreign exchange (fx) charges, on the other hand are a huge drain on your wallet. These foreign currency transactions would typically incur fx fees of 2%-3% imposed by the credit card issuer. Some websites allow you to convert your foreign currency purchases to SGD so that you settle your bill in SGD. Do not agree to that conversion! By choosing to pay in SGD, your payment will undergo a process called Dynamic Currency Conversion (DCC) which will incur even higher charges of between 7% to 15%. This can also happen with offline over the counter transactions – do not agree to pay in SGD or you will be charged DCC too! The problem with all these fees and charges is that you don’t see it when you pay for your purchases so you will be in for quite a shock when you see in your credit card bill how expensive your overseas/online purchases has become. DBS has recently launched a new scheme where customers with a DBS Visa Debit Card linked to a DBS Multi-Currency Account (MCA) can use their card to spend overseas in the country’s given local currency without any additional charges. This scheme is the first of its kind in Southeast Asia. That means you can skip all the FX fees and DCC charges when shopping in overseas-based online stores or when you pay with your debit card overseas. Here’s how it works. For example, if I was preparing for a trip to United States, I would first budget the amount of US Dollars (USD) required. Then I would perform instant funds transfer of my Singapore Dollars (SGD) to USD via my DBS MCA account when the rates felt reasonable to me. Using my DBS Visa debit card, I will then buy my Southwest Airlines flight ticket or children’s winter wear (via US-based carters.com) in USD. The amount is then directly deducted from my DBS MCA’s USD balance. No FX fees and DCC charges incurred at all! For those who need visuals, check out this step by step visual guide by DBS – learn more here: go.dbs.com/sg-mca. For existing DBS/POSB customers, the DBS MCA can be opened instantly online. It is fast and simple. This is a very simple process and you can do all these transactions on the go with DBS digibank app. No need to make your way down to money changers to compare rates and more importantly, no need to waste your time queuing at money changers! 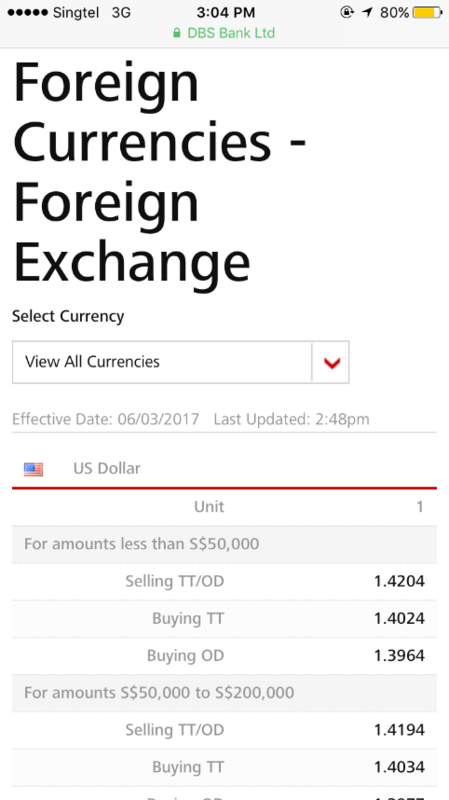 You can see the latest FX rates for the currency at DBS FX rates online page. Here’s a step by step guide on how you can do all these transactions on your mobile phone. 2) mB funds transfer Step 1. Select the desired currency for MCA. In this case, SGD to USD. 3) mB Funds transfer Step 2. Exchange rate is shown and for confirmation. After, pressing confirm, funds are converted to USD instantly! It’s that simple. Time taken, 30 sec max. 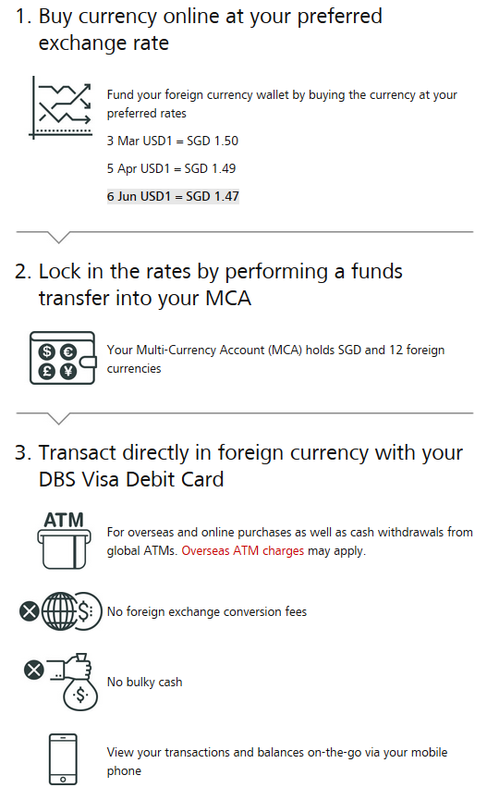 By linking a DBS Visa debit card to a DBS MCA, you can use your Visa card to transact in Singapore dollar and 11 foreign currencies at no foreign exchange and conversion fees. 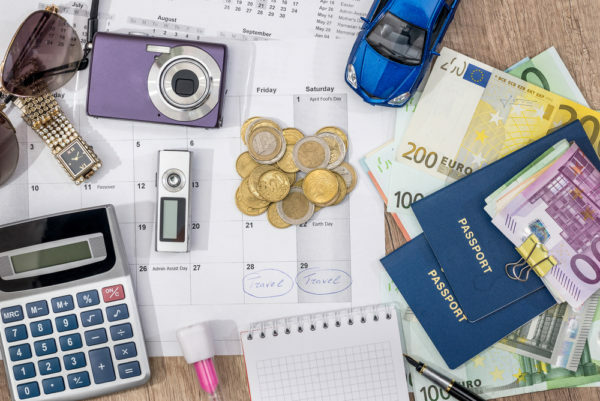 These 11 foreign currencies cover most of Singaporean’s favourite travel destinations – Japan and Australia for child-friendly destinations; Hong Kong and Thailand for bargain shopping and food. Honeymooners’ favourite – New Zealand is also in there. For those who want to fly further away for home for longer holidays -> USA, Canada, United Kingdom and Europe. And for those chasing the Northern lights – Sweden and Norway. How I had wished that the DBS MCA was introduced earlier – I could have achieved some savings with my trip to Hong Kong last December. 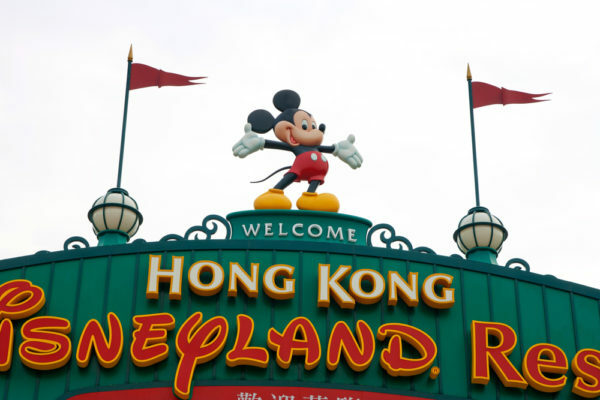 I had spent about HKD 3,500 on food and accommodation at Hong Kong Disneyland (where else to go with 2 young kids J) and another HKD 9,300 for accommodation on Hong Kong island itself. That added up to HKD 12,800 or SGD 2,400 of online pre-travel payment. By using a credit card, my HKD purchases are settled in SGD and I incurred not just FX fees but also DCC charges. 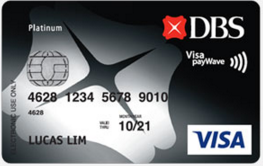 Paying with the DBS Visa debit card linked to a DBS MCA, I would have saved 3% in FX fees and 7 to 15% in DCC charges i.e. $240 to $432! That is more than enough to offset a lip smacking meal at Joy Hing (or any other roast meat favourites in HK) and that family photo at Disneyland that I inadvertently succumbed to, and a night stay in a decent Hong Kong hotel. And that’s just for the pre-planning spend on a short Hong Kong trip. I would have saved even more if I had used this DBS MCA scheme on my offline overseas spending during the trip. Or consider a 10-day trip to England and Scotland, made before the kids came along. I had spent about £50 per night on accommodation booked at UK’s www.premierinn.com. Prior bookings online for inter-city trains e.g. between Manchester and Glasgow cost about £110. Car rental in Isle of Skye, another £120. Not to forget, the experience that we looked forward most to -> the Premier League game package bought from Thomas Cook for about £300. The total transaction came up to around £1,000 or SGD 2,000 (exchange rate was about 2:1 then) and I would be looking at savings from FX fees and DCC charges of at least $200 to $360. Besides pre-trip bookings, you can also use your DBS Visa debit card (linked to your DBS MCA) on overseas purchases on location, skipping the money changer all together. Just like Tom below, my DBS Visa debit card is accepted worldwide and I can use it to buy a Starbucks coffee in New York city, knowing exactly how much it would cost me in SGD (as I had secured the USD at an exchange rate I was comfortable with before the trip). I would still recommend you hold some foreign currency in cash as cash would still be needed for purchases at smaller mom and pop stores or street markets such as the Ladies Market in Mongkok. 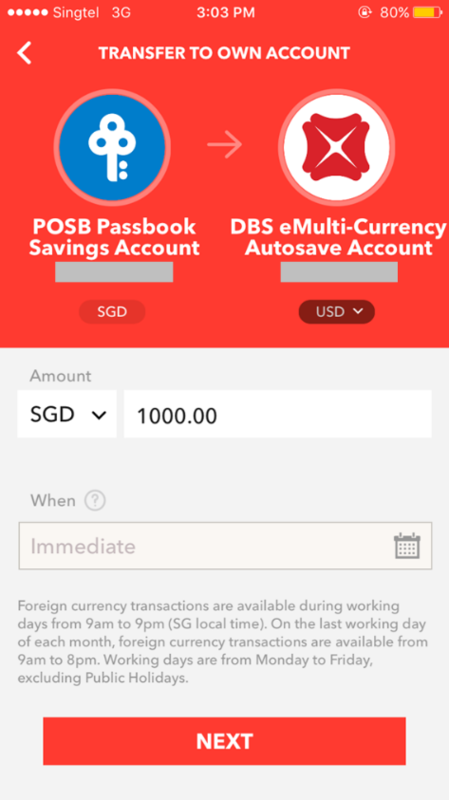 With the DBS multi-currency account and DBS Visa debit card, you can also withdraw cash from ATMs directly from your foreign currency wallets in the account as well. Most importantly, always ensure you have sufficient foreign currency funds in your DBS MCA. 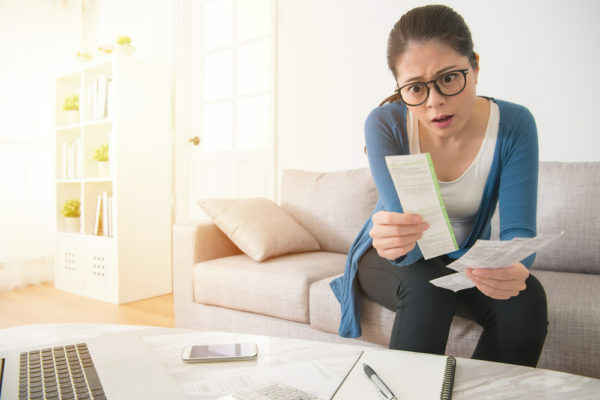 If you don’t have enough foreign currency funds in your DBS MCA, the foreign currency transaction will be deducted from your SGD funds and may incur charges. Also, do note that this is a debit card and not a credit card, so if you have insufficient SGD funds, the transaction will be declined. Partial withdrawal or purchase is not available. Signing up for a DBS MCA is very simple especially if you are already an existing DBS/POSB account holder. 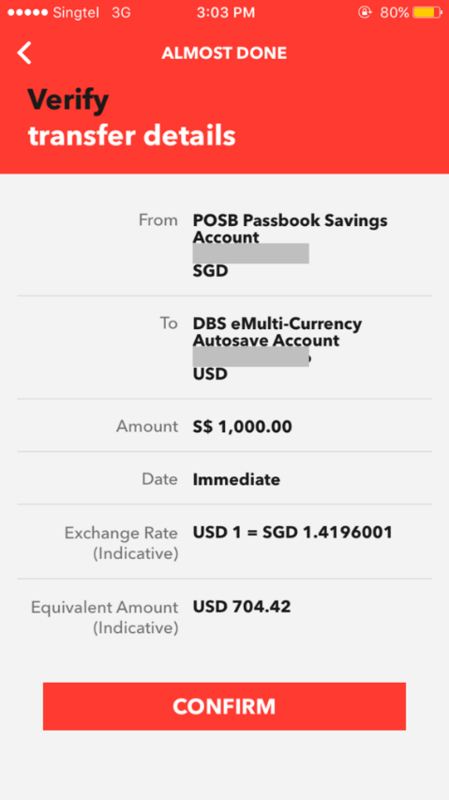 Existing customers can open a DBS eMulti-Currency Autosave Account instantly online. 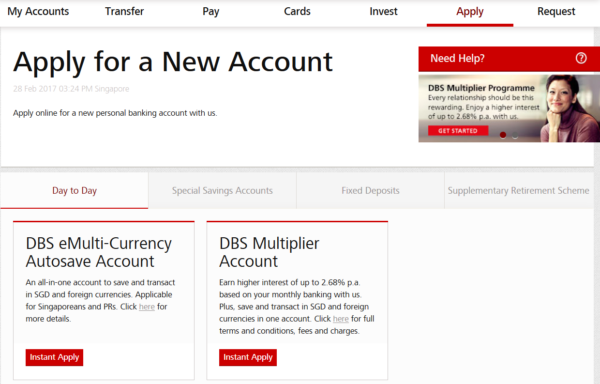 Here’s how you can do it -> Login to your DBS iBanking, select Apply -> Deposit Accounts -> DBS eMulti-Currency Autosave Account. Verify your details and you are then registered for a DBS MCA! Yes. That’s it! The final step is to link the MCA to the DBS Visa as the primary account. More details can be found here. Great information and article… I appreciate your time and efforts in your work. Great Job! Thank you so much for sharing it.